A 90 year old horticulturalist and Korean War veteran becomes a drug mule, transporting millions of dollars worth of cocaine to Chicago for a Mexican drug cartel. Directed, produced and starring Clint Eastwood. 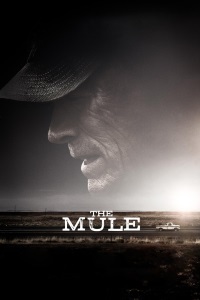 With Dianne Wiest as his ex-wife, Alison Eastwood as his estranged daughter, and Taissa Farmiga as his granddaughter. Also with Brad Cooper, Laurence Fishburne and Andy Garcia. It's not Eastwood's best work, but it's enjoyable and well-crafted, and Eastwood is very funny as a sly old geezer. I wonder if the title has anything to do with Eastwood's first credited film role, in a Francis the Talking Mule film. Sort of "I started off working for a mule, and now I AM the mule." If you didn't see it, here's Pete Davidson & John Mulaney reviewing "The Mule." Several scenes from this were filmed in Augusta, Georgia, so sooner or later, I'm probably going to have to check it out to see what locations I recognize. I know I spotted one or two from the trailer.